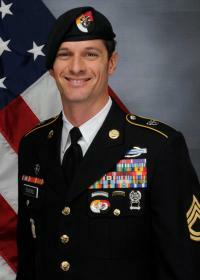 A former Dorchester resident has been killed in action in Afghanistan. Army Sgt. 1st Class Eric Michael Emond was one of three American servicemen killed in a roadside bombing Tuesday, according to the Department of Defense. Emond grew up in Fall River, but lived in Dorchester for three years in between some of his seven deployments on active combat duty. He leaves behind a wife and three children, according to reports. He was one of several Massachusetts veterans who launched Mass Fallen Heroes, an organization that seeks to honor men and women who have been killed while serving overseas since Sept. 11, 2001. Emond has been living in Washington state in recent years, but lived in a home near Adams Corner prior to relocating to the west. "Eric was a Great AMERICAN! He was severely wounded by an IED in Afghanistan in 2009, returned home to get treated and was a founding member of The Massachusetts Iraq and Afghanistan Fallen Heroes Memorial," wrote Dorchester's Edward Kelly in a Facebook post on Wednesday. "He didn’t have to go back, but chose to serve our country! Eric leaves behind his wife and 3 children. God Bless Brother...thank you for your sacrifice." Emond had more than 21 years of military service and was on his seventh overseas tour. He's been awarded the Bronze Star and the Purple Heart, among many decorations. Emond had been living in Brush Prairie, Washington. He was assigned to 1st Battalion, 3rd Special Forces Group. He was killed alongside Army Capt. Andrew Patrick Ross, age 29, of Lexington, Virginia; and Air Force Staff Sgt. Dylan J. Elchin, age 25, of Hookstown, Pennsylvania. They were killed in Ghazni province, an area where the Taliban is resurgent. It was the deadliest attack against U.S. forces in Afghanistan this year. The U.S. and NATO formally concluded their combat mission in Afghanistan in 2014, but still provide close support to Afghan forces and carry out counterterrorism operations. Some 15,000 American forces are currently serving in Afghanistan. The New York Times reports that so far in 2018, 12 American soldiers have died in combat in Afghanistan. Reports from WBUR— which partners with the Dorchester Reporter to share content and resources— was used in this report.